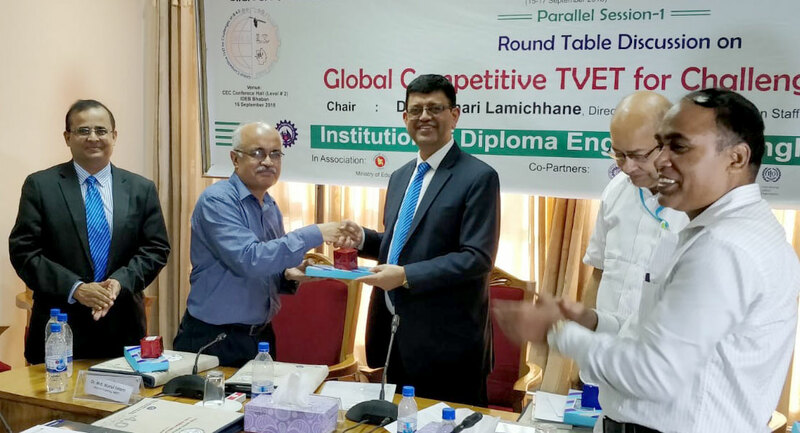 The CPSC Director General, Dr. Ramhari Lamichhane, and former CPSC Seconded Faculty, Dr. G. Kulanthaivel, were in Dhaka, Bangladesh from September 15 to 17, 2018 as presenters and guests of the International Seminar, Round Table and Policy Dialogue on "Global Competitive TVET for challenges of Industrial Revolution 4.0, Innovative professionalism & skills for achieving sustainable development goals (SDGs)-pathways of 4.0 Industrial Revolution". The organizers presenting a token to Dr. Lamichhane in his role as a moderator at the parallel session 1 of the seminar. 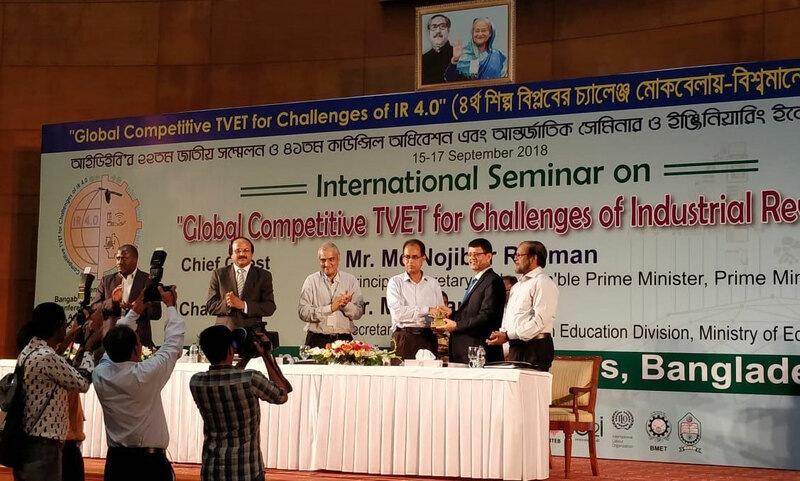 Organized by the Institute of Diploma Engineers, Bangladesh (IDEB), the international seminar aims to hold an open policy dialogue in order to understand how Bangladesh can respond to and prepare for facing challenge of the 4th Industrial Revolution. It was a combination of presentations, panel discussions, and small group discussions, structured to allow participants to openly share knowledge, opportunities, challenges and education strategies. The two-day international seminar was attended by almost 10,000 participants from 10 countries. It was formally opened by H.E. Prime Minister Sheikh Hasina of the People’s Republic of Bangladesh at a ceremony held on September 15, 2018. The discussions were based on overarching themes: the characteristics of the 4th Industrial Revolution, challenges of 4th IR, way of skilling up the peoples through TVET incorporating 4thm IR and way out for sustaining in global competitive job market. Given these themes, Dr. Lamichhane prepared and presented a paper that further discusses the role of TVET in the 4th industrial revolution. CPSC was also able to promote its services to the stakeholders of IDEB as it also anticipates more vigorous engagements with the organization in the future. A joint regional program and international seminars were envisioned to be arranged in the coming months as both organizations strengthen their ties to each other. 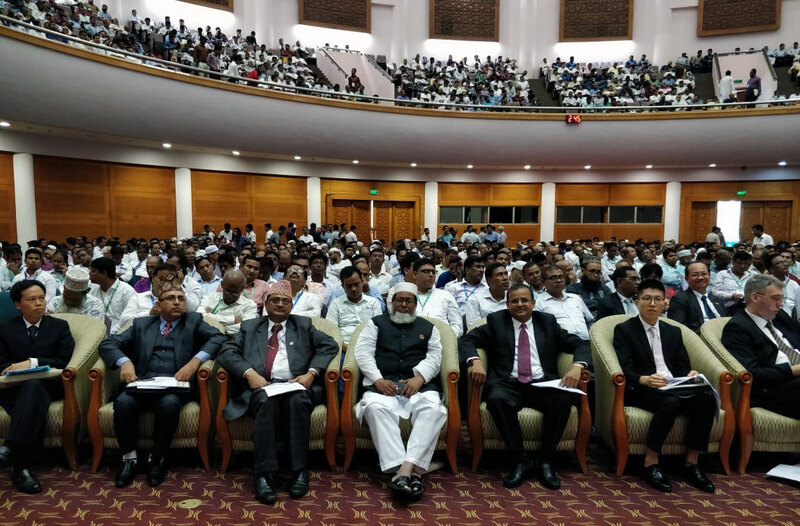 The CPSC Director General was also able to meet some of the key officials of the Government of Bangladesh and the IDEB, as well as other representatives of international offices based in the country, as a testament of this affirmation. 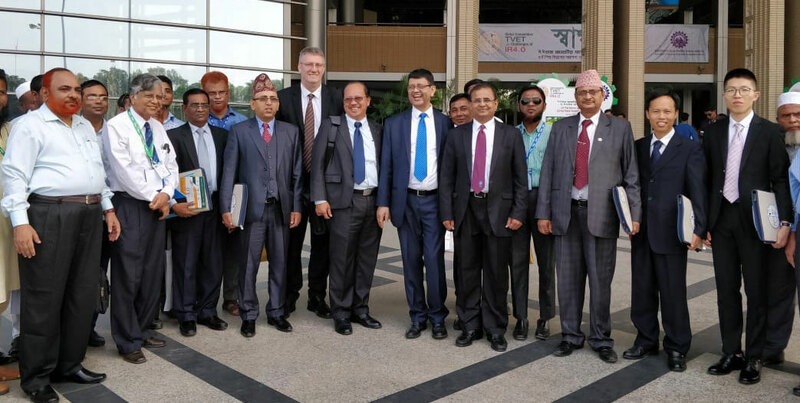 Dr. Lamichhane (center) with the IDEB officials and guests.